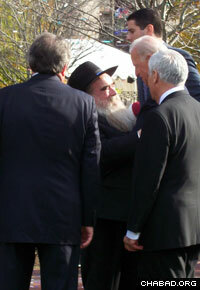 After his remarks at festivities celebrating the grand opening of the National Museum of American Jewish History in Philadelphia’s Old City, U.S. Vice President Joseph Biden invited Rabbi Abraham Shemtov, director of the city’s Lubavitcher Center and chairman of the umbrella organization Agudas Chasidei Chabad, to join him at the stage. Drawn by the chance to celebrate 350 years of American Jewish history at the newest addition to the most historic square mile in the nation’s first capital, hundreds of people from across the country descended on Philadelphia to hear Vice President Joseph Biden announce that a new museum’s Jewish stories were, in fact, manifestations of distinctly American ideals. “In telling the story of the American Jewish experience, this museum in my view, tells the story of America’s identity,” Biden said Sunday at festivities in front of the new $150 million home of the National Museum of American Jewish History. “We have to heed the words of Rabbi Menachem Mendel Schneerson,” stated Biden. “We should not satisfy ourselves with what we have accomplished and we should always strive to realize the potentials and abilities that G-d has given us to perfect the world. After his remarks, the vice president instructed his Secret Service agents to invite Rabbi Abraham Shemtov, the director of the Lubavitcher Center in Philadelphia, to make his way from the audience and join him at the stage. The two embraced for several minutes. The Rebbe’s guidance, noted Shemtov, strengthened a modern spiritual awakening on these shores and inspired generations of Jewish activists and leaders. Other speakers on Sunday, including Pennsylvania Gov. Ed Rendell and Philadelphia Mayor Michael Nutter, pointed to the museum’s location – caddy corner to Independence Hall – as significant. The Rebbe, Rabbi Menachem M. Schneerson, of righteous memory, is one of 18 individuals to be included in a permanent exhibit at the National Museum of American Jewish History, which officially opens this month in Philadelphia.